Your office desk is likely filled with inexpensive plastic accessories (e.g. pencil holder, tape dispenser). This gives your office a generic and cheap look. Whether it’s an office cubicle or a home office, add a chic style to your desk with a luxury paper tray from Marlborough of England. Our luxury trays are made from our factories in England and made by hand from the very best craftsmen. 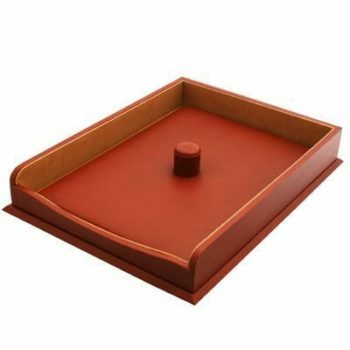 The tray is covered in authentic leather, giving it a luxury look. The underside of the lid is lined in Nubuck, providing a soft surface for keeping papers crease-free. Oh, and in case you’re wondering, yes, leather has a place on an office desk just as much as it does in a wardrobe closet. One look at our night trays, and we think you’ll agree. Your office is your personal space. 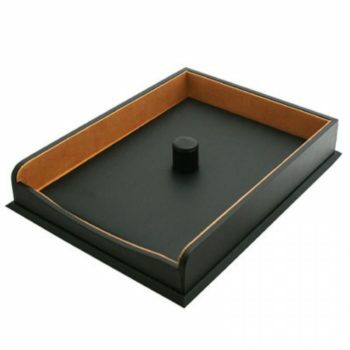 Personalize your desk with our leather night tray. It will serve as a centrepiece that commands attention because it is just as visually stylish as it is functional.